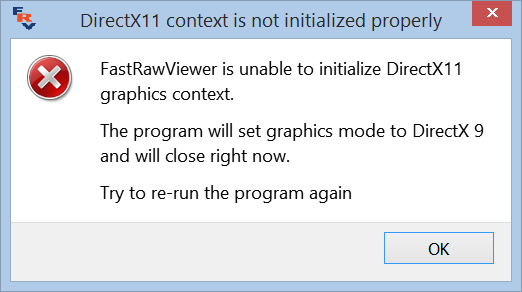 In some cases (to the best of our knowledge, this will only happen due to an old graphics driver), FastRawViewer cannot use the automatically selected graphics engine. 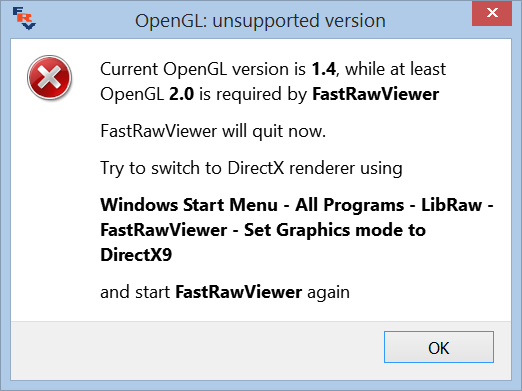 FastRawViewer informs the user that the version of OpenGL available in the system does not support the features necessary for the program to operate, and offers to manually switch to the graphics acceleration through DirectX 9 (see below, the section “Manually Changing Graphics Modes”). 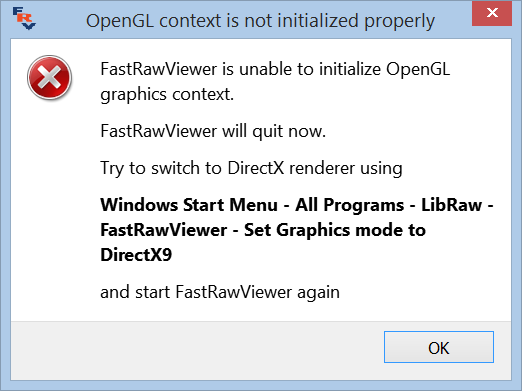 FastRawViewer informs the user that the version of DirectX available in the system does not support the features necessary for the program to operate; and switches to OpenGL, which will be used upon the next program launch. 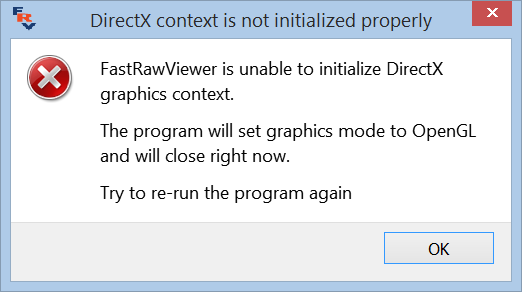 FastRawViewer informs the user that the version of DirectX 11 available in the system does not support the features necessary for the program to operate; and switches to DirectX9, which will be used upon the next program launch. (if the automatically selected graphics engine turns to be inadequate, then access to the settings is impossible, as the program itself cannot be launched). 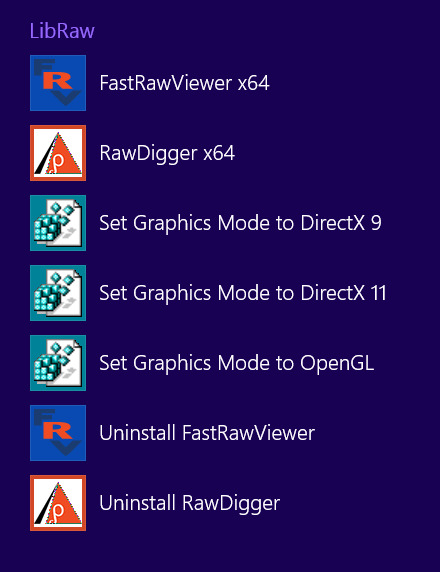 The Registry scripts shown above must be used in the case that FastRawViewer informs the user that the available version of OpenGL is inadequate and suggests switching to DirectX. This window indicates that the graphics driver cannot process those sub-routines that FastRawViewer needs to execute on the video card. Switch to the other version of the graphics engine (if you're using OpenGL – change to DirectX and vice versa). A description of the engine switch is given in the previous section. Update the driver of your video card to the newest version. When opening a file, a black screen is shown instead of the image. 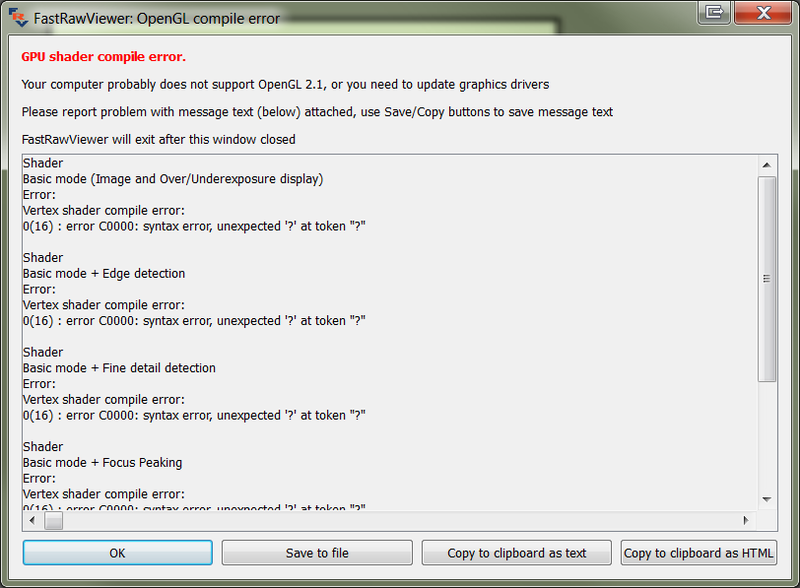 This problem is due to some incompatibility between FastRawViewer and the installed graphics drivers. When moving to the next file, or when changing the white balance or the contrast curve, the screen does not fully update, and square-shaped areas filled with the previous image remain. This problem only happens for Windows XP, and only for old Intel graphics cards (845G and the like). 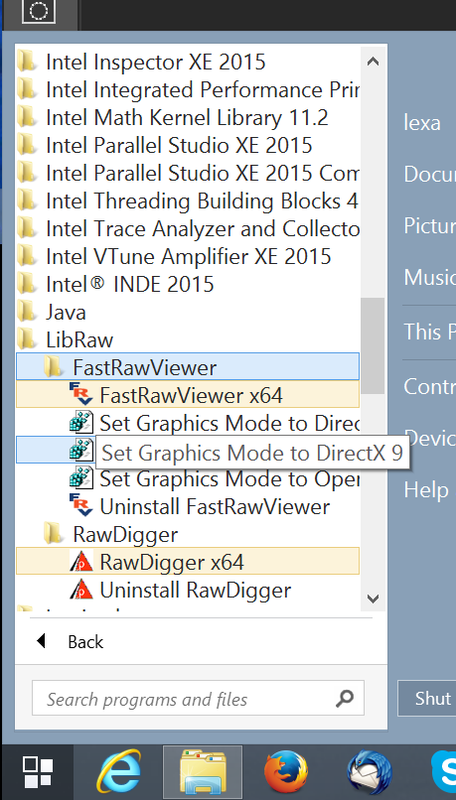 Turn GPU Processing – GPU Compatibility settings – Refresh window after image changed: to Slight resize in the Preferences. When turning on this setting, the application window will twitch by one pixel for each image redraw. Upgrade to Windows 7 – Intel graphics drivers for Windows 7 do not have this problem. If your problem is not listed above, then, to make troubleshooting faster, please turn on your Debug Log, (see below) and when contacting support please attach a copy of the debug information. 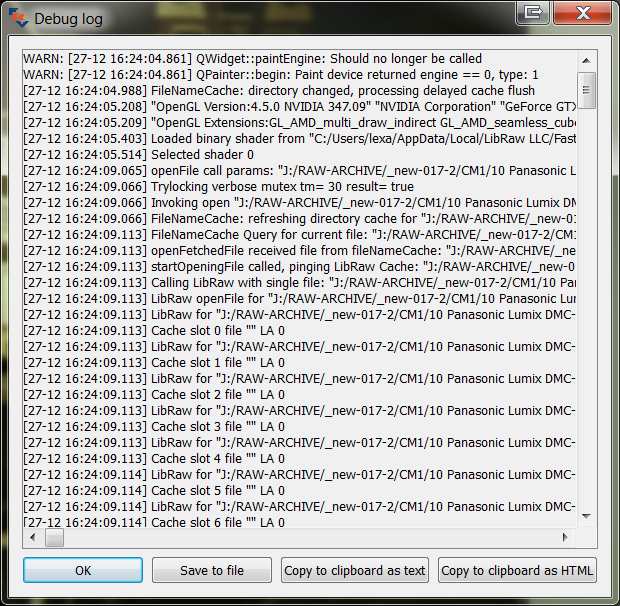 To turn on the output of debug information, turn Other –Debug log messages in the Preferences to ‘All’. Can be saved in a text file (the Save to file button). Can be copied as text into the clipboard (for applications which expect text in the clipboard: most email applications). Can be copied as HTML into the clipboard (for applications which expect 'rich text' in the clipboard, like text processors). When turning to tech support, please remember to attach the debug log.